Tomorrowland is a new science-fiction/mystery movie directed by Brad Bird and starring George Clooney, Hugh Laurie, Britt Robertson, Raffey Cassidy, Thomas Robinson and country star Tim McGraw. The movie is heavily inspired and titled after the futuristic theme land at Disney theme parks. I enjoy a lot of Bird’s animated work, such as The Incredibles and Ratatouille, and his debut live-action film, Mission Impossible: Ghost Protocol, is one of my absolute favorite action movies. For those reasons, I was excited to see what he would do with this project. Furthermore, I enjoy a lot of George Clooney’s movies, such as, Batman and Robin (just kidding), Ocean’s Eleven and Gravity. Having said that, the duo of Bird and Clooney, coupled with some mysterious trailers, made me really interested to see this movie. As I mentioned before, Tomorowland is heavily inspired by the same-named Disney theme land. That futuristic world is present in this movie, and a handful of lucky people who come across a special pin with a “T” logo on it can get there by simply touching the pin. 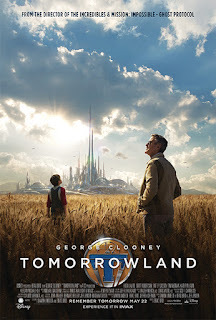 A middle-aged man named Frank Walker (George Clooney), actually discovered one of those pins himself, visiting Tomorrowland as a curious and adventurous young boy genius. Unfortunately, he developed into a bit of a grouch ever since. 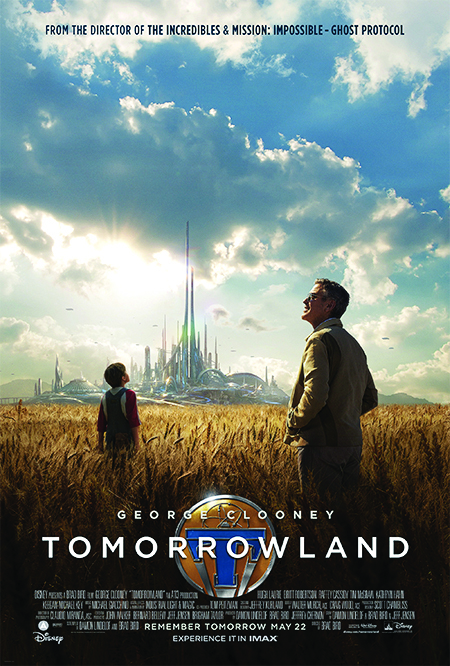 Now, an ambitious teenage girl named Casey Newton (Britt Robertson) is trying to get his help and return to Tomorrowland to discover what it can offer for the future. Overall, I had a pretty good time with Tomorrowland. Unlike the extremely violent Mad Max: Fury Road, the PG rating of this movie made this a much better family movie experience. That being considered, this movie still took a little too long to get going, and was a bit boring in parts. However, Brad Bird’s distinct style of directing made for a visually impressive movie experience that was lots of fun to watch. The acting also made up for some of the slower parts, as George Clooney was great as usual and all of the young actors and actresses around him were actually quite impressive. I would also add that Hugh Laurie (aka House) was very good in his role. All in all, Tomorrowland was a little bit disappointing for me, but it is certainly still a decent summer movie that is solid entertainment for people of all different ages.